With four exhibitions in the British capital this summer and a lifetime achievement award under his belt, the artist, designer and architect credits being an outsider as his greatest influence. 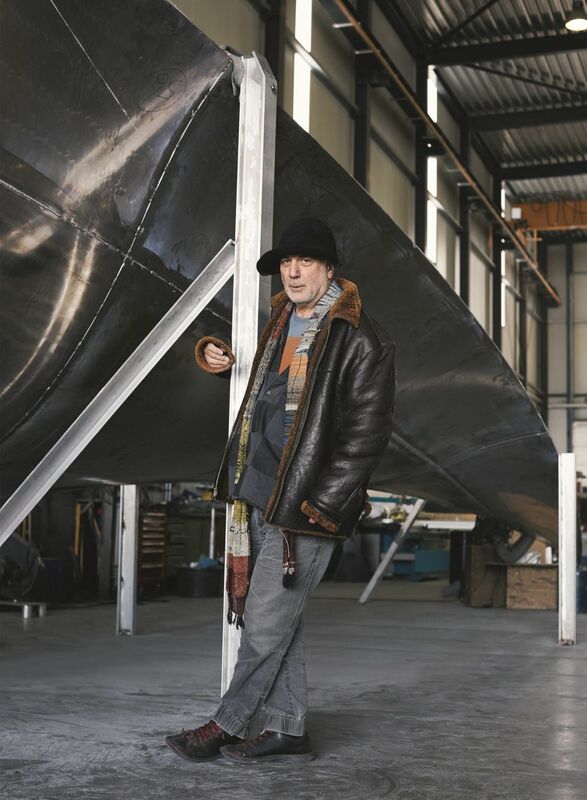 If you happen to be visiting London in August, you can fill an entire day just touring the works of the Israeli artist, designer and architect Ron Arad, who lives and works in the city. Three of his projects will be exhibited in public spaces in the British capital, in addition to a large exhibition that will open in a commercial gallery. In the meantime, in Washington, the Watergate Hotel — yes, the famous site of the break-in that lead to the downfall of Richard Nixon — reopened its doors last week and Arad’s architectural firm was responsible for the redesign of its public spaces. Arad admits that he usually works on a number of projects at the same time, but such a confluence of major events is exceptional, even for him. The interview with Arad was held just before his trip to Milan to receive the Compasso d’Oro award for lifetime achievement from ADI, the Italian industrial design association. 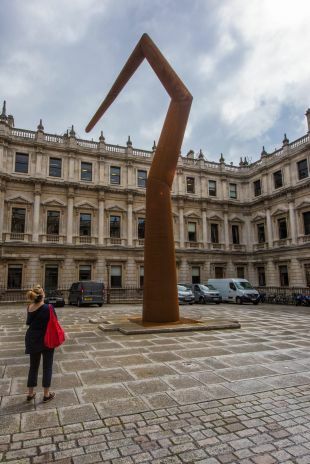 Every year the Royal Academy of Arts selects a different artist to plan a work for the courtyard entrance to the building, to be on display throughout the summer. This year, the Royal Academy chose Arad, who is also one of the Academy's 80 members. The enormous kinetic sculpture, named Spyre, is a sort of rust-colored arm or finger 18 meters tall, divided by joints which rise, fall and rotate through a system of motors and other mechanical workings. Each segment moves at a different speed, so that the sculpture’s unpredictable acrobatic postures are never repeated. It has an “eye” at its tip containing a camera which will constantly film its surroundings. Whatever it films will be streamed to a screen on the façade of the Royal Academy building, and on its website, so that visitors can view whatever Spyre “sees.” “You look at it, and it somehow looks at you too,” says Arad. “Works of love" is what Arad calls the works displayed in public spaces. The summer show at the commercial gallery Ben Brown Fine Arts may be a sales exhibition, but the creation process was similar. Here, too, some of the works were made by various workshops according to Arad’s instructions, and he did not see them until they were completed. 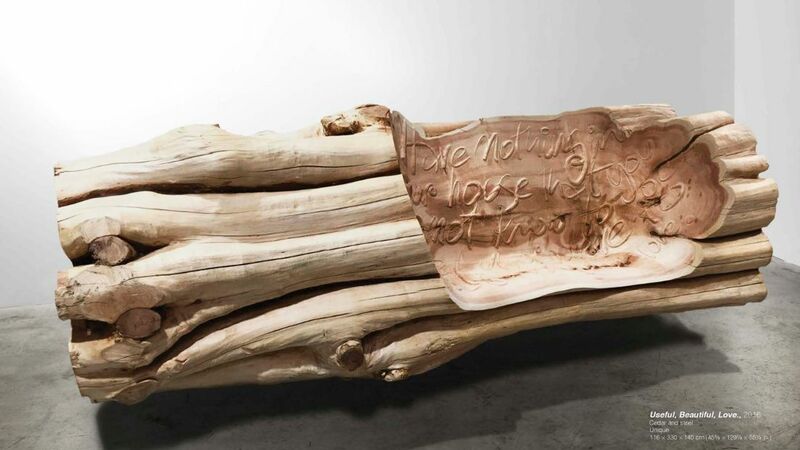 Arad asked the workshop to hew a niche for sitting inside the log, and to carve a phrase in his own handwriting. “The cutting was done on a sophisticated robotic machine, which carves and engraves according to the computer model I made,” he explained. 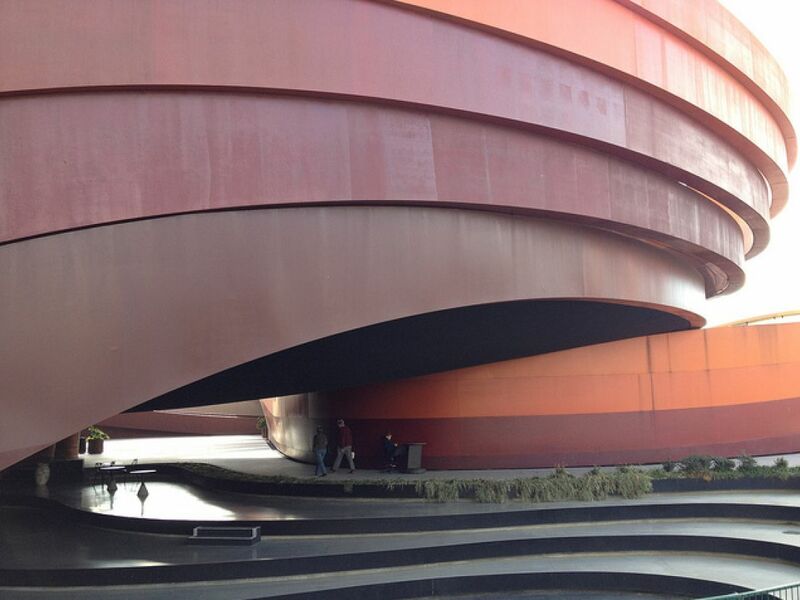 Hidden inside is a mechanism that causes the bench to hover above the floor like a glider when visitors sit on it. Another work displayed at the exhibition, which runs from June 22 through September 15, is a large map of China that looks as if it's balancing on one point. Completed six years ago, it was meant to be shown in Shanghai at the Expo fair, but the Chinese refused to display it because the sculpture did not depict what they call “Greater China" — Hong Kong, for example, is missing from the map. Born in Tel Aviv in 1951, Arad started studying at the Bezalel Academy of Art and Design in Jerusalem at age 22 and later moved to the Architectural Association School of Architecture in London. One of the first places Arad saw in London was the St. Pancras station, a splendorous Victorian structure. It was the marketplace of the old world, “an amazing space,” he says. “I thought, what do you do in this busy and action- and motion-filled place? I wanted to create something that has movement and direction like a train, but doesn’t move either,” he said. The result is a sort of metal wave hung from the ceiling of the station, as if floating over the heads of the passengers, whose movement creates an optical illusion of lightness, without a beginning or end. In this case too, the development of the idea and the planning was easy and quick, says Arad — but the implementation was a completely different story. The source of the metal was a shipbuilding factory in Groningen, Holland. Arad is now busy with the final touches. The third of Arad’s works in public spaces this summer will be exhibited at the Roundhouse, a performing arts and concert venue. It is a reconstruction of “720 Degrees,” a work that the Israel Museum in Jerusalem exhibited four years ago. 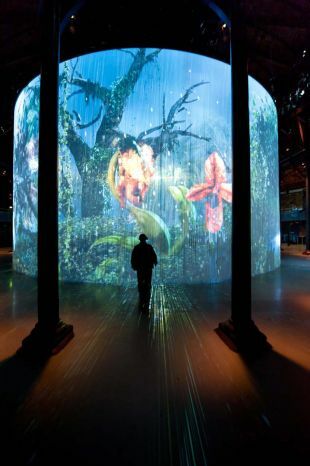 It will be on display from August 8 to August 28 in the Roundhouse's main space as part of its 50th anniversary celebrations, with the title “Curtain Call.” The floor-to-ceiling artwork is made of 5,600 silicon rods suspended from an 18-meter diameter ring. In Israel, Arad is busy with quite a number of architectural projects: The Design Museum Holon, two office buildings under construction in Tel Aviv and a cancer treatment center in Afula that will be completed in 2018. However, he is very concerned about recent events at the Design Museum, whose unique structure he planned and where he also sits on the board of trustees. The museum’s chief curator, Galit Gaon, is leaving this week; for now, Maya Dvash, the former director of the museum's website, has been named as a temporary replacement. Other senior executives at the Mediatheque complex in Holon, where the museum is located, have also left in recent months. No replacements have been named so far and the exhibition plan for 2017 hasn't been drawn up yet. After you placed your first and only sculpture (so far) in a public space in Israel at the Tel Aviv University in 2011, art critic Gideon Ofrat described you as an “artist in exile.” Do you identify with this description?